We got a chance to play with the Opera Mini App for the iPhone during MWC 2010. Here is our take on the app after using it for a short duration. The first thing we noticed about the app is that the UI is pretty much the same as Opera Mini on other Touchscreen phones. There is the famous speed dial which lets you bookmark your 9 favourite websites.There is also Bookmark syncing and Password management in place. What was amazing was the speed in which the pages loaded over the excruciatingly slow Wi-Fi connection. Most websites loaded 4-5 times faster on Opera Mini when compared to Safari. You can also choose to turn-off images to improve speed. This app uses the well known Opera compression technology to remotely download webpages before sending the information to the phone. This means that you will save a lot of money paid for data charges unless you are on a unlimited browsing plan. This might also bring some good news to Operators in markets suffering from iPhone browsing explosion. If you have used Opera Mini on any other device , Opera Mini for iPhone will look pretty much the same as there are no iPhone specific UI changes. There is no pinch zooming but only double tap like in other versions of Opera Mini. You can switch between multiple tabs using the tab preview at the bottom of the screen.One cool thing about the app is that it saves the exact state of the browsing session even after exiting the app. This will be pretty useful if you forget to bookmark something . Now the million dollar question is whether Apple will approve Opera Mini on the App Store? While Opera argues that Opera Mini is not aimed at being a replacement for Safari, Apple has rejected several apps from the App-store for interfering with the core iPhone functionality. But as Opera mini can be seen as more like a service rather than a complete browser, they have strong point. Opera aims to submit the App to Apple once it’s ready. It’s currently in beta and you can’t download it anywhere . 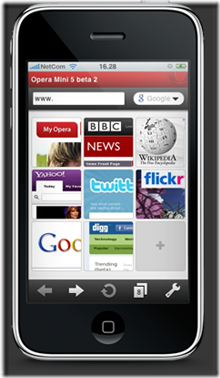 We just hope Apple approves Opera Mini for the iPhone ! Opera did not let anyone take photographs or videos of the app on the iPhone. All we have is the screenshot above.